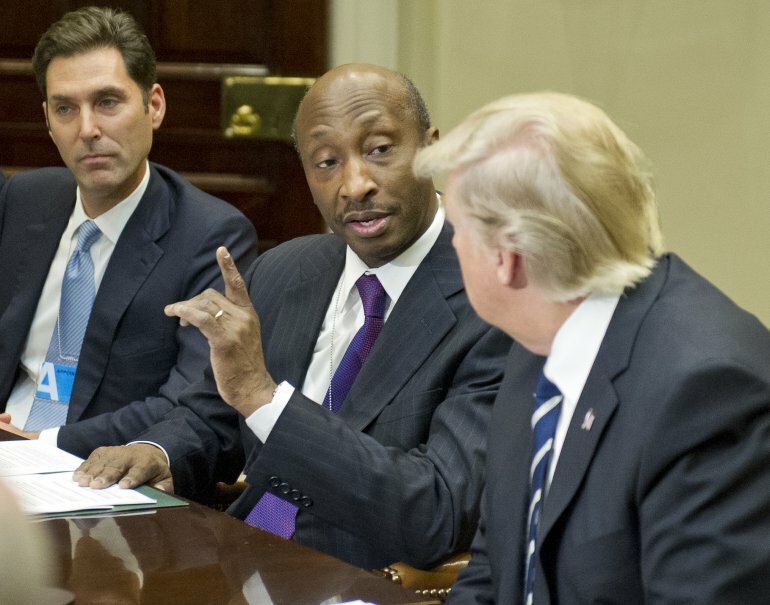 President Donald Trump, flanked by Merck CEO Kenneth Frazier, left, and Celgene CEO Robert Hugin speaks during a meeting with pharmaceutical company CEOs. (by Roberta Rampton and Deena Beasley, Reuters) – U.S. President Donald Trump in a meeting on Tuesday with pharmaceutical executives called on them to manufacture more of their drugs in the United States and cut prices, while vowing to speed approval of new medicines and ease regulation. Trump told them the government was paying “astronomical” prices for medicines in its [medicare and medicaid] health programs for older, disabled and poor people and said he would soon appoint a new U.S. Food and Drug Administration leader. “We’re going to streamline the FDA,” President Trump said in a statement, referring to the regulatory agency responsible for vetting that new drugs are safe and effective. …Attending the meeting were top executives [from pharmaceutical companies] Merck, Johnson & Johnson, Celgene, Eli Lilly, Amgen and Switzerland’s Novartis, as well as the head of the Pharmaceutical Research and Manufacturers of America (PhRMA) lobbying group. According to a transcript of the televised portion of the meeting, Amgen Chief Executive Officer Robert Bradway promised to add 1,600 U.S. jobs at his California-based biotechnology company this year. Kenneth C. Frazier, Chairman and CEO of Merck & Co makes remarks to President Trump during a meeting in the Roosevelt Room of the White House on January 31, 2017. “Tax, deregulation – those are things that could really help us expand operations,” Lilly CEO Dave Ricks said. “We have to get prices down for a lot of reasons. We have no choice, for Medicare and Medicaid,” President Trump said, citing the nation’s government insurance programs for the elderly, the poor and the disabled. President Trump also said currency devaluation by other countries had increased drugmakers’ outsourcing their production, and he called on the companies to make more of their products in the United States. The United States typically pays more for drugs than any other developed nation…. 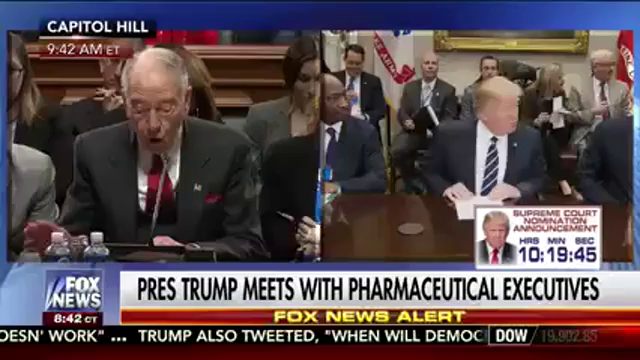 [“The U.S. drug companies have produced extraordinary results for our country, but the pricing has been astronomical for our country,” the president said after meeting with drug industry executives on Tuesday at the White House. 2. What did President Trump tell the heads of the companies he would do to help them? 3. a) What is the role of the FDA? b) What did the president say about the FDA? 4. a) How many people does Amgen employ in the U.S.? b) How many jobs did the CEO promise to add this year? 5. a) What did Eli Lilly CEO Dave Ricks say would help his company expand operations? b) What negative effect does outdated regulation have on the industry (or any industry)? 6. What overall reaction did the executives have to the meeting with President Trump? 7. a) What do you think of President Trump’s meeting with the pharmaceutical company CEOs? (will he get drug prices lowered?) Please explain your answer. 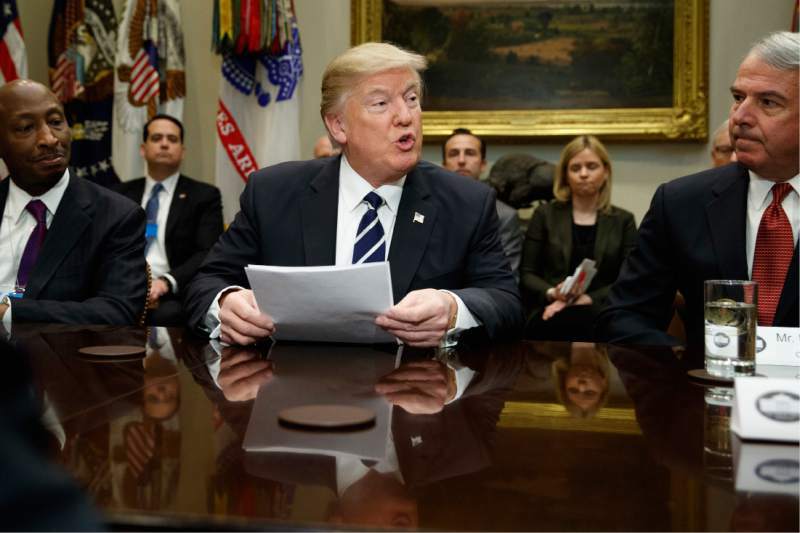 b) What do you think of President Trump’s vow to reduce federal government regulations as a way to help businesses – including the action he took this week to reduce regulations for small businesses? Please explain your answer.